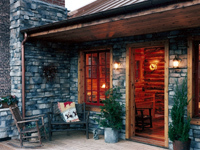 WITH name-brand folks like Tom Brokaw, Ralph Lauren and Jane Fonda all homesteading the wide open spaces of the Old West, what's a famous film maker in search of seclusion to do but put up his log cabin right in the heart of New York City? "He wanted to be able to tell people he was going away to a weekend cabin without revealing that it was just upstairs," said Abigail Shachat, the designer of the not-so-far-off getaway, who has been sworn to secrecy regarding her client's identity. 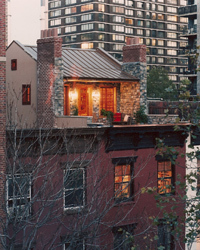 The one-room cabin, though located atop a brownstone in residential midtown, is invisible from below. Only four stories above the street, it feels as isolated as if it were on the frontier, not with expansive vistas of the plains and the mountains but of the tarred rooftops and water towers of the East 30's. The commission was deceptively simple: a one-room expansion to a floor-through apartment on top of a generic brownstone. More idyllically put, the clients wanted a Lilliputian-size place to write, to sleep and to dream; no more. Besides, the couple are expecting a child and needed more room than their modest two-bedroom apartment allowed. The reticent movie maker (known for highly stylized sets) and his wife did not dictate an overall concept or specific details to the designer, leaving her to conjure on her own whether this escapist dwelling should look more "Treasure of the Sierra Madre" or "Bonanza," or more "Walden Pond" than "Little House on the Prairie." "They came to me with a hope chest of disparate ideas," Ms. Shachat said, recalling in particular a sketch for a carved bedstead featuring a bronco branded with the film maker's initials, a desire for a crescent moon cut out of the bathroom door (a common outhouse motif), and the dream of a wood-burning stove. Ms. Shachat plunged into more in-depth research. 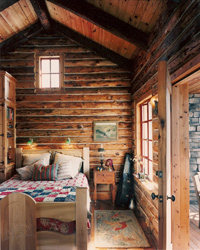 Luckily, log cabins are in vogue right now and there are quite a few books on the subject covering everything from old Adirondack fishing camps to the stone and beam lodges of Yellowstone Park, not to mention the monthly magazine Log Home Living. "I knew I didn't want to design a modern log cabin," Ms. Shachat said. "They look so fake to me because even though they're made of real logs, the spaces are usually oversized and the wood for the logs has been stripped of all its notches and personality. "My clients were after something more primitive and old fashioned, like Abe Lincoln's cabin or even the one shown on Log Cabin syrup." In other words, this wasn't about shopping for cowboy style, but rather about investing a rooftop addition with all the humble and hopeful feelings of pioneers experiencing a strange new world. Come to think of it, New York does a pretty good job of simulating life in hostile territories. In this project, the first setback came when Ms. Shachat learned that no exterior in the city can be made of more than 20 percent wood, as a fire prevention. So nix to the log half of the log-cabin equation. Then came the realization that in order to have a wood-burning stove with the proper clearances the overall space would have to be much larger than planned. A certain square footage for additions, in this case 25 percent of the total square footage of the rooftop, is permitted to converted multiple dwellings, in this case a brownstone, but to exceed that requires a special variance and would have added $50,000 to the cost of construction. Dreams of a wood-burning stove went up in smoke and the project shrank from 400 square feet to 280 square feet (but rebounded to 400 with the front porch). 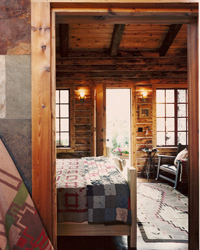 Built off of an existing stairway to the roof, with its small landing incorporated into the bedroom, the so-called cabin is constructed of a steel-beam foundation with concrete block walls surfaced on the exterior with stucco and stone veneer and on the interior with hemlock log facings. The doors, window trim, rafters and floors are all of pine, oak and chestnut recycled from old barns in Pennsylvania and New Jersey. "Even though it's not a true log cabin, a tremendous amount of craft went into making it feel authentic," said Ms. Shachat, who was trained to appreciate craftsmanship at the Cranbrook Academy of Art in Bloomfield Hills, Mich., adding that the contractor, Ron Attinello of Montauk, L.I., is actually a cabinetmaker. A close friend of the clients, Mr. Attinello lavished attention on the job as if it were a fine cabinet rather than a building. The hemlock facings, which normally would have been sliced off the logs and discarded, were preserved and cut especially to scale for the project at a small mill in northeast Pennsylvania; then the bark was chiseled off by hand and the facings were stacked to cure for the winter. When they were finally attached to the supporting wood and lathe structure, it was with old-fashioned square nails. The roof beams were all hand hewn and joined on the site. The roof itself is made of standing-seam copper so that the sound of falling rain could sometimes block out the noise of drive-by sirens coming up from the street. 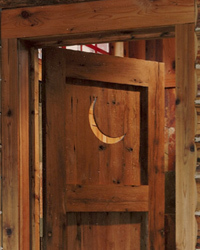 A crescent moon has been duly carved in the bathroom door, although the walls inside are not of wood but China multicolored slate tiles ($7.80 a square foot at retail). "To my mind wood and water don't mix," said Ms. Shachat, who chose the motley colored stone because it reminded her of rocks dredged up from a river bed. Lolling in the tub -- a reproduction claw-foot from Waterworks in Manhattan, with all-nickel fixtures -- it is possible to see the Chrysler Building through a small window in a dormer. The size and placement of the windows are, in fact, a further instance of clever adaptation to Draconian ordinances. New York City fire codes specify the relative size of windows. In addition, windows adjacent to other buildings' property lines cannot be operable. Undaunted -- "log cabins always had tiny windows" -- Ms. Shachat placed small wire-glass openings on each wall in addition to two larger working windows flanking a door onto the small roof deck. "I wanted the windows to function like an hourglass," she said, so that light would be thrown down in shafts to mark the movement of the sun as it travels across the floor from dawn to dusk. The bed is positioned to catch the first rays of early light and the windows on the north side are deliberately small to block views of various mechanical apparatuses sharing the roof. Luckily, the project encountered no opposition from the neighbors or from the tenants in the two other apartments in the brownstone co-op. In fact, the latter generously donated some of their potential square footage for expanding to allow the bathroom to exceed the allotted space. In turn, the building's entrance and stairwell were replastered and painted in the process of bringing electricity to the roof. Because it is a turn-of-the-century brownstone, today's stringent handicapped-access requirements did not apply. Even so, it took five months to obtain all the necessary permits for construction. In the end, the project was approximately on budget at $270,000. Although it may be ersatz, this "log cabin" manages to convey the same kind of optimistic integrity and ingenuity that went into building the real things. According to the reclusive movie maker's wife, "No one knows this, but my husband spends all his time up there." No commuting distance and no Nosy Parkers: what more could you ask for a getaway? A NEW YORK rooftop addition qualifies as one of those dare-to-dream projects, but with bureaucratic diligence and a saint's patience, it is possible. Start early: obtaining permits, necessary before touching a single tar-covered brick, can take at least six months. In this case, securing air rights was not necessary: Each building has its own F.A.R. (for floor-area ratio) that defines its potential for expansion, but it is the individual co-op boards that decide if roof additions are occupying air-rights space. This three-co-op brownstone classified as a converted multiple dwelling and needed no variance for residents to build on 25 percent of the rooftop. (The owners obtained permission to use 30 percent of the roof; the additional 5 percent came from the tenants of the two other apartments, who donated some of their allowable expansion footage.) An independent expediter, Hannibal Galin, guided the designer, Abigail Shachat, through the maze of city permits and codes. His fee: $5,000. Material integrity: The logs may not be whole -- they're sliced log facings -- but Ms. Shachat strove for the greatest degree of authenticity possible in all the other materials for the project. For the interior, the wide plank flooring was made of pine recycled from an old barn in western Pennsylvania. The boards were lightly sanded ("It tends to look more worn when the edges have been eased or softened with a sander," said Ron Attinello, the contractor). Pine and oak rafters were salvaged from an old barn in Pennsylvania. The thick chestnut door leading onto the deck is not as stolid as it appears: insulation material is sandwiched between layers of wood panels re-sawn from old barn beams of chestnut. "They're extremely stable," Mr. Attinello explained. "They stay dead straight when you saw them, unlike newly dried wood, which can twist and move." Because chestnut wood is no longer available, Mr. Attinello pointed out, "the only place you can find it is in old supplies, or from people who salvage old homes and barns." Conklin Antique Lumber in Susquehanna, Pa., provided the barn beams and old pine flooring; (717) 465-3832. Mr. Attinello made furniture to order, including the carved bedstead ($2,800), an armoire ($3,500) and medicine cabinets.